If you're new to the world of silent film, D.W. Griffith's The Birth of a Nation (1915) doubles as the best and worst introduction. This 187-minute American epic paints a racially-charged, largely fictional tale with a suspicious historical backdrop...and in today's world, no studio would touch it with a ten-foot pole. 96 years ago, the film's nationwide release caused quite a controversy, bolstering the relatively-new NAACP while leading to violent protests and canceled screenings. The Birth of a Nation was also the first film to be screened at the White House for president Woodrow Wilson, spawning an oft-used (and unverified) quote regarding its "terribly true" story elements. It's undoubtedly one of history's most vilified and notorious motion pictures, but The Birth of a Nation is also one of the most influential. Any way you slice it, Griffith's film is a technical marvel and a true epic. Among other firsts, The Birth of a Nation heralds the first uses of nighttime cinematography, color tinting, film-specific scoring, panning camera shots, iris effects, still shots and much, much more. Our story takes place before, during and after the American Civil War and follows the fictional Stoneman and Cameron families as the conflict affects them. Forced to represent opposite sides in the all-consuming war, former schoolmates Phil Stoneman (Elmer Clifton) and Ben Cameron (Henry Walthall) nonetheless attempt to remain friends. Our focus eventually shifts to the anarchy of the Southern states after the conflict ends, as well as Phil and Ben's mutual love for their respective sisters Elsie (Lilian Gish) and Margaret (Miriam Cooper). Divided into two parts, The Birth of a Nation is mostly remembered and reviled for its second act, when we witness the birth of the Ku Klux Klan and the film's heroic, sweeping portrayal of it. Other offenses include the use of rather poor "blackface" makeup; this is doubly repulsive, since most of the applicable characters are portrayed as primitive villains with no redeeming qualities. Most anyone can see why The Birth of a Nation is a tough film to defend: like Leni Riefenstahl's Triumph of the Will (1935), it's thinly-disguised propaganda that gives racists something concrete to rally behind. Yet The Birth of a Nation's artistic merits are what should be remembered first, because movies simply wouldn't be the same without them. 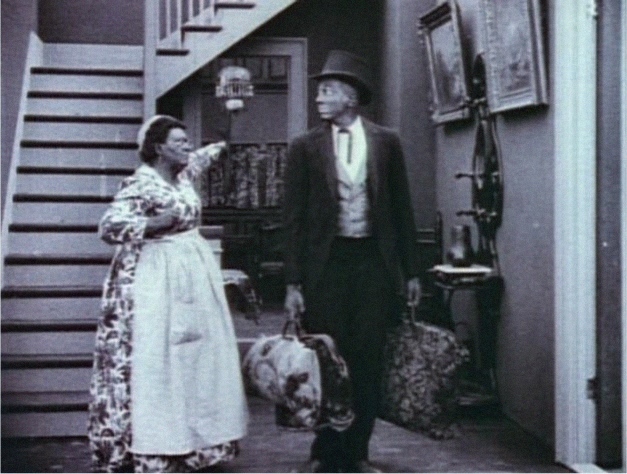 So strong was the film's impact that D.W. Griffith followed it with the redemptive Intolerance and rising black filmmakers like Oscar Micheaux countered with their own racially-themed productions. During the last century, The Birth of a Nation has maintained its notoriety, for better or for worse: some curse its existence, but it's been preserved in the National Film Registry for nearly 20 years. Home video releases were originally few and far between, although Kino Video has been a long-time supporter of the film on DVD. Kino returns with The Birth of a Nation on Blu-Ray, which pairs a new 2011 restoration and audio presentation with vintage bonus features from the 2002 Masterworks DVD release. If you've yet to see D.W. Griffith's most infamous production, this certainly wouldn't be a bad starting point. 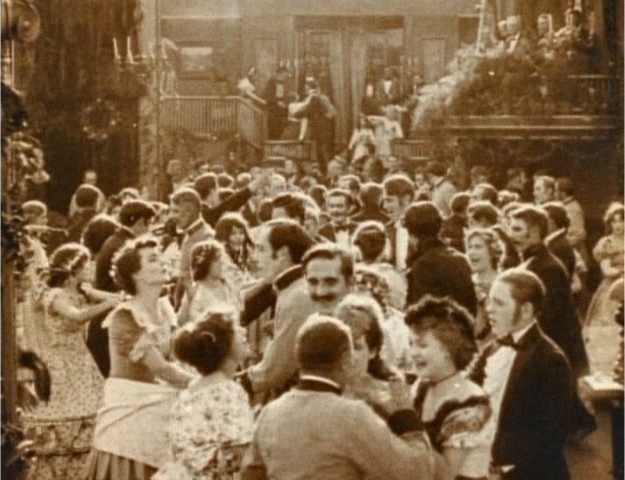 It's tough to accurately judge a silent film approaching the century mark, but here goes: Birth of a Nation has never looked better on home video. This 1080p transfer presents the film in its original 1.33:1 aspect ratio, the image is fairly stable and a quick glance at the 2002 DVD release shows a marked improvement in detail, clarity and cleanliness. Even so, Birth of a Nation still looks rough: a countless number of scratches and marks still mar the image, frames often jump and black levels fluctuate wildly. These problems can be ignored, as the source material is undoubtedly in fairly bad shape by now. The only subjective complaint I can muster is a bit too much emphasis on color tinting; a number of sequences are more saturated than past releases, which can be a little distracting. Yet Birth of a Nation still looks mighty impressive, all things considered, and fans should be pleased with Kino's efforts. The audio is a little easier to judge: this silent film is paired with an impressive DTS-HD 5.1 Master Audio track featuring a soundtrack rendition by the Mont Alto Motion Picture Orchestra, which is also available in a PCM Stereo mix. It's a fantastic effort and provides a nice accompaniment to the film, even if the crispness of the audio stands in contrast to the visuals. For obvious reasons, traditional subtitles and captions are not offered during the main feature, but it's a shame they haven't been included during applicable extras. Seen below, this three-disc set is housed in a slightly thicker-than-normal keepcase that snaps shut at the hinge. Attractive dual-sided artwork and a Kino promotional insert are included, as well as a sturdy and rather tight-fitting slipcover. This 187-minute film is divided into less than 24 chapters, no obvious layer change is present and this Blu-Ray appears to be unlocked for region-free playback. Menus are smooth, practical and easy to navigate. A nice assortment, but nothing new here. Disc One includes vintage Filmed Introductions featuring Griffith and actor Walter Huston during both parts and the intermission. These casual chats are as corny as ever, especially those lovable scamps at the beginning. Disc Two is simply recycled from the 2002 Kino Masterworks Edition. Our main attraction is the 1993 Restoration Version of the main feature, a modestly different effort with less color tinkering but even more print damage. Also returning is a Production Documentary by David Shepard (who also supervised the 1993 restoration) and Russell Merritt, which goes into modest detail about the film's infamous reception, history and lasting influence. Disc Three is also recycled from the 2002 Kino Masterworks Edition. Returning supplements include seven Civil War Shorts directed by Griffith ("In the Border States", "The House with Closed Shutters", "The Fugitive", "His Trust", "His Trust Fulfilled", "The Battle" and "Swords & Hearts"), as well as the enlightening "New York vs. The Birth of a Nation" (a collection of documents pertaining to the film's fiery legal issues during its re-release) and a few Excerpts from original souvenir books and vintage programs. Again, this isn't a bad effort for a nearly 100 year-old film, but it's too bad that nothing new was added for good measure. Historically important? Without a doubt. Entertaining? Not especially. D.W. Griffith's Birth of a Nation is quickly approaching the century mark and has positively influenced a countless number of motion pictures, but the film's vitriolic story elements often overshadow its substantial artistic merits. Bottom line: this infamous picture is still worth watching, Kino's Blu-Ray doesn't offer any new bonus features and the technical upgrade should definitely appeal to curious newcomers and silent film veterans alike. Mildly Recommended. NOTE: The above captures were obtained from a DVD source and do not represent Blu-Ray's native resolution. Randy Miller III is an office monkey based in Harrisburg, PA. He also does freelance design projects, teaches art classes at a local gallery and runs a website or two in his spare time. He also enjoys slacking off and writing in third person.